Originally made by Van Cleef & Arpels in 1965 as a necklace clasp, as a special order, the Princess not long after had it converted into a brooch. H.S.H. Cecil Amelia von Fürstenberg was the lively and exuberant daughter of Sarah Campbell and Robert Lee Blaffer of Texas and the devoted wife of H.S.H. Prince Tassilo von Fürstenberg (1903-1991). Her Texan background was a legacy of the burgeoning oil industry of the early 20th century: her mother's family, the Campbells, founded the Texas Company which would later be known as Texaco, and her father's, the company Humble Oil, which later became Exxon. Princess von Fürstenberg was a celebrated hostess fluent in four languages, an avid art collector and a tireless traveller with a passion for opera and European history. Moreover, as a generous patron of the arts and renowned philanthropist, the Princess devoted much of her energy to charitable causes. Amongst other foundations established internationally to further the study of art, architecture and opera, she had created the Cecil Amelia Blaffer Foundation which she merged with the Sarah Campbell Blaffer Foundation, the charity her mother had originally established as a museum without walls and on whose board she served as a trustee for more than thirty-five years. She was also a founding member of Northwood University's National Art Collection Committee and recipient of their Distinguished Women's Award of 1972. She married H.S.H. Prince Tassilo von Fürstenberg in 1975, taking the title Her Serene Highness Princess Cecil Amelia von Fürstenberg. The Princess' vivacious personality, passion for art, and love of life were perfectly epitomised in the form of her fabulous jewels. 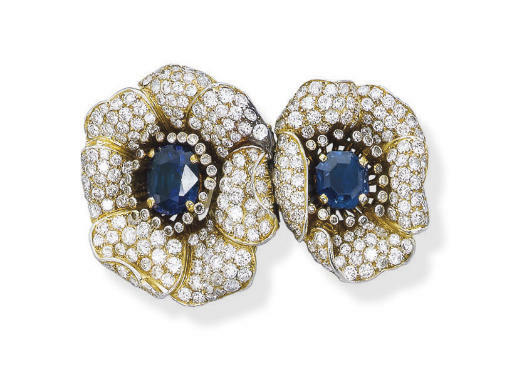 Her almost unwavering patronage of the Maison Van Cleef & Arpels during the 1960s is self-evident, with jewels often acquired from this illustrious house by Special Order: pieces designed especially for, and at times with, the client, and in the case of the Princess, employing beautiful diamonds, emeralds and rubies often supplied by the Princess herself. Princess von Fürstenburg had a trained eye for classic jewels and fine gemstones mounted in distinctive, and often unique, settings. Her collection of personal jewellery reveals a lady with a strong sense of style and exquisite taste, and as such, is a fitting compliment to the remarkable woman behind this splendid collection.